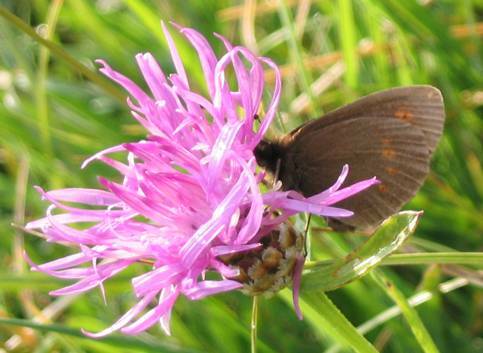 This is quite a common species in Alpine meadows both above and below the tree line. The top picture is taken around 2200m and below about 1600m. The flight is characteristically slow and fluttering and the butterfly stops fairly regularly so you don't need to sprint around for hours trying to observe it! That said, although I saw many, I don't have any decent photos!! 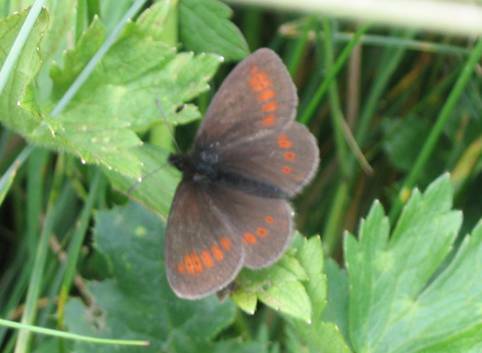 The upperside markings are pretty constant with females having more pin-prick eyespots on the forewings than males. Also the wings are nicely rounded. The underside is similar to the upperside with consistently four red blobs on the hindwing of which that in space 4 is the largest and that in space 3 slightly displaced towards the exterior.